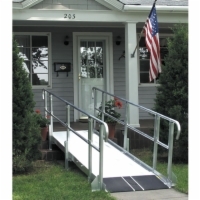 Modular ramps are aluminum alternatives to long wooden access ramps often seen outside homes and businesses. Compared to wooden ramps, modular ramps are quicker to install, lighter in weight, won't corrode or rot, and can be easily reconfigured or moved. Models are available for use in residential or commercial locations. Choose this modular ramp for commercial use as it's ADA compliant. This includes the availability of ADA handrail extensions, guardrails, and gates. Little or no preparation or maintenance necessary. Easy to build, move, and reconfigure.